Get More Out of Your Next Event! 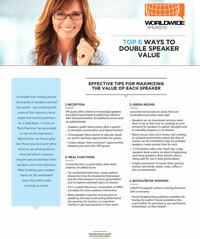 Maximize the value of your speaker. A benefit from having placed thousands of speakers around the world – and working with some of the industry’s most respected meeting planners on a daily basis –is that our “Best Practices” are grounded in real-world experience. Beyond that, we thoroughly test these practices and refine them to see what performs best and which scenarios require special attention from speakers and event planners. Plan meal functions for moderated interviews. Create upfront interaction time for moderator/interviewer and the interviewee(s) to learn personalities and to explore potential topics of interest. Speakers are an investment and you want them to be at their best so creating an environment like a green room for speakers to gather thoughts and to mentally prepare is a no-brainer. Avoid disappointing audience members by having the author's book available at the event (either for purchase or pre-purchase, beforehand, on their behalf). Download the full checklist for FREE by filling out the form!